Anyone can make this restaurant quality salsa at home. It’s not too chunky or completely pureed, but in my opinion is the perfect consistency for dipping. No blender. No food processor. Just tomatoes from a carton, some onion, garlic, cilantro, lime juice and a few seasonings. My preference is to buy Pomi brand tomatoes in a carton. You want to get the finely chopped ones. This way they come ready to go for salsa. If you haven’t tried this brand before, you will be in for a treat. You can buy them at Publix or other local grocery store right next to the canned tomatoes. Let sit for a couple of minutes and enjoy! 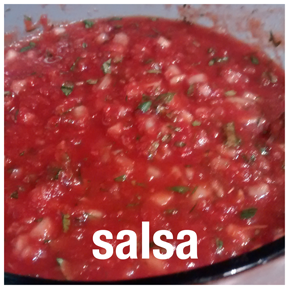 This entry was posted in Recipes and tagged home, mexican, recipe, salsa. Bookmark the permalink.